Santal Massoïa is the tenth fragrance in the Hermessence Collection from Hermès, and like the others, was developed by house perfumer Jean-Claude Ellena. Unless you're new to the collection, you probably already have some idea of what to expect, that is, you know not to expect Santal Massoïa to fit neatly into your idea of a sandalwood (or massoia) fragrance, and you know that this isn't the place to go looking for the functional perfume to last through your 8 hour workday. I've already gone on and on about my take on the collection, and if you've been reading here regularly you also know that there's about a 50-50 chance that I'll want at least a small bottle of Santal Massoïa, and I've said it before but I'll say it again: thank you, Hermès, a million times over, for the lovely little 15 ml bottles. And I'll save you time and start with the outcome: yes, it's 15-ml-bottle-worthy, no, it isn't going to join Osmanthe Yunnan and Vetiver Tonka in the 100-ml-bottle-worthy category. Given the size of my overall perfume collection, the 100-ml-bottle-worthy category, mind you, is now very narrow indeed, but another way of putting it is that I really like Santal Massoïa but I'm not head-over-heels swooning, although once upon a time I might have said the same of Brin de Reglisse and now I'm in the position of having to replace what I had of it. So sometimes only time will tell. So yes, we have a very soft and sheer milky woods. As with Vanille Galante, it's liberally sweetened, but also as with Vanille Galante, it's sheer enough that it the sweetness doesn't read as overwhelming. It's fruity and crisp in the beginning, and then lightly green and lightly figgy, then as it dries down further the woods take on a toasted-with-vanilla-sugar aspect, but again, it's all 'distant', just as promised. Several others have noted that the dry down has something vaguely in common with the nutty-doughy finish to L'Artisan Parfumeur Bois Farine, and I would never have thought of it but yes, it does, vaguely, albeit without the heavy cedar pencil note that make Bois Farine hard for some people to wear. If it were slightly heavier and creamier, it would probably qualify as a comfort scent, but it's really too airy to qualify as such. I did not love it the first time I smelled it, but I've liked it more and more on subsequent wearings. If you've smelled it, do comment, and if you haven't, do chime in anyway and tell us your favorite Hermessence. 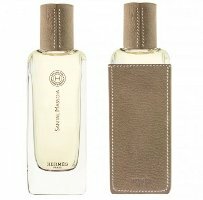 Hermès Santal Massoïa is available in 100 ml Eau de Toilette, $235, or in a 15 ml bottle sold in mix 'n match groups of 4 (the "Gift set") for $145. Shown just above is the 100 ml bottle with optional leather case, $575. Thank you for the review . I’ve been waiting to hear about this one . VG is my favorite from this line . I have a sample of Brin de Reglisse & am going to revisit it . Brin de Reglisse really grew on me. I liked it to begin with, but I never thought I’d “remember” to wear it, and I really do. Robin, you’ve inspired me to give Brin de Reglisse another chance…will dig out the sample tonight. Can’t hurt, esp. if you already have the sample! So far, the Nazgul and Vetiver Tonka are the only ones to really wow me, but I am looking forward to trying this one; I’d like to find four, so that I can fill the mix’n’match set with different fumes! I’m so glad you explained that one! LOL LOTR! Hmmmm…. you are really making me want to seek this one out, as much as most of the collection hasn’t worked for me. No dreaded aquatic notes whatsoever? It’s a very polite fragrance, isn’t it? But then, I find a lot of JCE’s creations to be well mannered that way. I passed by Hermes last week and brought a sample home and well, I’m still undecided. It’s nice enough but, to my nose, it’s more green, slightly milky fig than sandalwood. Or any wood, for that matter. I think that I-like-it-but-I’m-not-swooning is pretty much spot on for me too. Maybe once I get over the disappointment that it’s not a cozy, creamy sandalwood, I’ll like it more. And, yes, it’s probably my fault for expecting/hoping to smell that type of scent. My favourite Hermessences are Ambre Narguile (I think I’m more that half way through my 100ml), Vetiver Tonka and Osmanthe Yunnan which I’d like to own some day when my samples finally run out. You know, no matter how much I *know* to ignore the name, I still am always surprised by the smell. I wish they wouldn’t put “ingredients” in the names, we’d all have an easier time of it. I agree, at least for cases when the contents blatantly don’t match the label! I always liked Luca Turin’s quip that the name of any given Le Labo fragrance was the one thing that scent would _not_ smell of. Ha, yes, I remember seeing that! I haven’t smelled any of them yet but I’m doing a basket dance with a sample of Gaiac 10 as we speak. Very interesting! I like the same ones as you do from this collection… so I am tempted of trying this one… I still have not tried Iris Ooky, so this time it will be a two for one….. I have pretty much entirely forgotten about Iris Ooky, that’s how little I liked it! Really want to try this one! So far I own a 15 ml set with Iris Ukioke, Rose Ikebana, Vanille Galante and Ambre Narguile, those 15 ml bottles really are a perfect size! My favorites are Iris Ukioke and the Nazgul aka Ambre Narguile. Mayby a new set of four, but how to decide which ones?! Have you tried any of the others? Only briefly once at the store. I’m tempted by the descriptions of this new one, Osmante Yunnan and Vetivier Tonka mostly I think. I’ve never seen anyone fond of Paprika Brazil, is tht the least popular one? There are a few people that are wild about it, but I’d be shocked if it was one of the big sellers. I adore Osmanthe Yunnan, but of course there are people that don’t like it. I haven’t tried it yet and now you’ve reminded me that I need to get to the mall for a sample before Thanksgiving hits and Christmas shopping madness takes over. My favorite Hermessences are Rose Ikebana, Osmanthe Yunnan and Ambre Narguile. Yes, and the madness will start soon! I was there last night and it already seemed crowded. Thanks for the review, Robin. I’m looking forward to smelling this — as I always am with J-CE and Hermès, which is most definitely a favorite house. I’m in on an upcoming split for 5ml, which for me is practically the new sample size. And yes, huge thanks to the house of H for those 15ml sets! I was totally surprised that on Facebook the other day, someone compared this to Philosykos, of all things. Do you see any similarity, even slight, there? I think all the Hermèssences are pretty nice, though I definitely gravitate to some more than others. I recently acquired my only 100ml bottle of one of them: Vanille Galante, which really has been the only one that I considered a 100ml candidate. The watery vanilla lily just called to me. Anyway, we’ll see how it goes with this Santal Massoïa (I assume that’s pronounced “mass-oh-ee-uh”? I’m intrigued by the essential oil link). 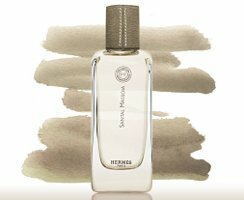 Sandalwood tangent: today I almost wore a very new decant of the long-discontinued Crabtree & Evelyn Extract of Mysore Sandalwood. Really curious about that one. I am not surprised about the Phylosikos mention. There’s clearly something figgy about it so anyone who’s smelled Philosikos or Un Jardin en Méditerranée or Fico di Amalfi might find similarities. I did too although I’d say that this is more… silky in texture. Oh, I’m curious too…do report back on the C&E! Gosh. It’s figgy for a bit, but to me, not so much as Philosykos, and not for as long. I mean, Philosykos is *about* fig, this doesn’t seem to be about fig. Tell me later if I’m wrong! The gift sets are so nicely done, too…so nice that they make the 15 ml bottles just (ok, almost) as nice as the 100 ml bottles. I also appreciate that the per-ounce cost of the 15 mL bottles is barely more than that of the 100 mLs…so unusual to not be punished for wanting just a little juice. Gah, I checked UK H.com (why?!?) and noticed that for some reason the gift set price has gone from over £100 down to £88. So now I’m thinking things that I probably shouldn’t be thinking. Oh, and so would I be! I can’t wait to try this one. The only one I’ve really loved so far is Vetiver Tonka—I’m on my second 15 ml bottle and will probably buy the 100 ml eventually. I like Osmanthe Yunnan quite a lot but unfortunately it lasts only about five minutes on me. I also have a decant of Brin de Reglisse but just don’t think to wear it very often… may have to wear it this weekend. You know, initially I thought the OY was fleeting, too. Then one day I realized it actually lasts at least 6 hours on me — it just stays very, very close to the skin. Which is fine by me. I do ok with Osmanthe Yunnan if I spray…dabbed from a sample, it’s useless. Maybe I would have liked OY then. I really like the opening tea notes and osmanthus but I only had a tiny dab sample and even when I tried to completely wet a spot with it, the smell would last about 7 seconds! It does much better sprayed, but even then you’re looking at a couple hours, so depends on how much you care about longevity. I look forward to anything by JCE (even an air freshener would be divine I swear) but only Iris Oooky lasts on me, although my heart is given to Vetiver Tonka. The Poivre Samarcande 15ml bought at the same time is almost untouched and I could be (easily) seduced into swapping it, if anyone has a temptation….. I did not love PS either, although it layers nicely. Thanks for the review! I’m looking forward to trying this one… currently my favorite is Vetiver Tonka… perfect for fall weather, too! Thanks for the review, Robin — this is a must-try for me. I adore Bois Farine so I’ll be interested to see how they compare on the drydown. My favorite Hermessence is definitely Vetiver Tonka, though I really appreciate Ambre Narguile too as the cold weather sets in. I really would never have thought of it, and they’re hardly what I’d call alike…more like a reference, maybe? I always have longevity issues with the Hermenessance fragrances. How is this one on this aspect? Oh, it is on the low end, I’d say! So if that bothers you, it’s probably out although it never hurts to try. I like many of this line, of course, but there is no contest as to favorite: Osmanthe Yunnan. It’s probably the only 100 ml worthy one for me, although I also have Vanille Galante in the travel set and it’s pretty darn awesome, too. Rose Ikebana is very pretty and a solid third, but I’ve got so many other things on my to-buy list, I’ll probably never own it. I think this one is going to sit fairly comfortably in the middle of the pack, but you never know. I do wish it had more presence – I don’t mind quiet, milky notes, but this one is almost inaudible. OY is easily my most worn. I have a hard time saying whether I like that or Vetiver Tonka better though. I wished I like the current Hermes scents better! The bottles are so lovely, and the concepts always sound appealing, but they usually don’t quite work for me. So far, oddly, the Hermessence I’ve like the best is Iris Ukiyoé. So I’ll try this one eventually just in case it also surprises me. Oh, stay as you are — you’re saving money! I find the longevity of hermessences diabolically poor – would spring for 100ml bottles of Vetiver Tonka and osmanthe Yunnan if they weren’t so fleeting. They are not powerhouses, it’s true. I’m ok with a perfume not being a power-house, but if it doesn’t last at least 3 hours, then I see it as a dismal performer. Your comment is very accurate: is almost diabolical, while the concept, the promise of the construction of the very scent, is the opposite. I have no scents by Hermes. Which oneRobinshould I start with? Ivebeen doing some looking around for something my closest place to smell it is Macy’s. I guess I’ll go tonight any ones in particular? Please help???? I can’t remember if Macy’s has anything by Hermes or not. Sephora has a few. Neiman Marcus has more. But none of those will have the Hermessences. Doesn’t matter — try Kelly Caleche and Jardin Sur Le Nil if you see them, and Eau des Merveilles. Thanks for this review Robin- I have been curious about it! Sounds like it could be a hit or a miss (battleship anyone)…I fell hard early on for Vetiver Tonka- and acquired two 15ml bottles. But at some point, Osmanthe Yunnan snuck in and ousted VT- and it is a scent I wear often and adore. I will get a 100ml at some point, but have gotten by with decants and a 15ml thus far. I have done the same — gone through multiple 15 ml bottles before giving in & getting the big size! I have been given this with three other 15ml botles and I… detest it. My poor husband. It is well done, well worthy Ellena (I have/had most of his scents and I deeply love them) but this one smells like old, eccentric, rich bt not very well groomed grand-dad. Old men indeed. I tried it and tried it but the best think I can say about it is a hint of licirice somewhere. I love Rocabar and Belami so I am finde with those “od men” stuff but this one… meeeh. I surprisingly dislike also Reglisse I confess.